In Drug Channel Institute's list of the top 15 pharmacies of 2018, we show that many of the largest U.S. pharmacies are now central-fill mail and specialty pharmacies operated by PBMs and insurers. 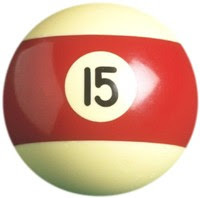 To complement that broader list, below you’ll find the Drug Channels Institute list of the top 15 pharmacies based on specialty drug dispensing revenues. As you will see, PBMs and insurers dominate specialty drug dispensing channels. The top four companies—all of which are fully or partly owned by a PBM—accounted for more than 70% of prescription revenues from pharmacy-dispensed specialty drugs. Payer- and PBM-owned specialty pharmacies’ market shares grew in 2018, due largely to merger and acquisition transactions. PBMs are earning an increasing share of their profits from specialty dispensing activities. Don’t be surprised if drug channel reform starts examining the connection between specialty pharmacies’ profits and brand-name list prices. Drug Channels Institute will host an exclusive new webinar, Preparing for a World Without Rebates, on Friday, April 12, 2019, from 12 p.m. to 1:00 p.m. ET. 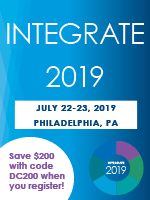 Get informed about the hottest topic facing our industry. Registration closes at midnight on Thursday. CLICK HERE TO LEARN MORE AND SIGN UP. We estimate that in 2018, retail, mail, long-term care, and specialty pharmacies dispensed about $146 billion in specialty pharmaceuticals. 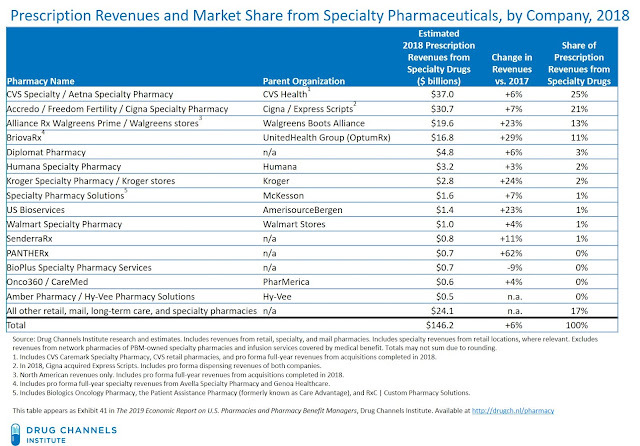 The exhibit below—one of 180 in our new 2019 Economic Report on U.S. Pharmacies and Pharmacy Benefit Managers—ranks the largest pharmacies based on revenues from the dispensing of specialty pharmaceuticals. The market continued to consolidate. We estimate that the top four companies’ share grew, from 66% in 2017 to 70% in 2018. The higher share of the top four companies was due partly to: (1) the pro forma combination of Express Scripts with Cigna, (2) CVS Health’s acquisition of five specialty pharmacies, and (3) OptumRx’s acquisition of Avella Specialty Pharmacy and Genoa Healthcare. Avella and Cigna had both appeared on our 2017 list of the largest specialty pharmacies. For a broader look at the industry's M&A activity, see Specialty Pharmacy M&A: Our Look at 2018’s Deals. Specialty drugs are dispensed primarily from manufacturer- and payer-defined networks. 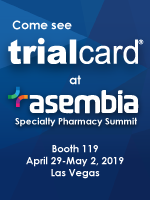 The concentration of specialty dispensing revenues shown above results largely from strategies used by payers and manufacturers to narrow specialty drug channels. Manufacturers continue to limit and manage the specialty pharmacies eligible to dispense these expensive medications, though these decisions can be controversial. PBMs and health plans typically further limit the number of specialty pharmacies selected by the manufacturer by requiring patients to use the specialty pharmacy that the plan or PBM owns and operates. The specialty pharmacy market is maturing. Independent specialty pharmacies in 2018 faced slowing growth and mounting competitive pressures. Smaller specialty pharmacies struggled to access specialty medications within payer and PBM networks. These pharmacies also dealt with the profit challenges associated with direct and indirect (DIR) remuneration payments to Medicare part D plans. For further evidence, look no further than Diplomat Pharmacy’s recent revelation that its January revenues were “significantly below expectations” and took a huge impairment charge for its PBM business. This announcement triggered a major stock sell off. Hospitals and health systems are coming up. No health system or hospital reports its revenues from dispensing specialty prescriptions. Exhibit 50 of our new report shows Drug Channels Institute’s estimates for 10 of the largest specialty pharmacies owned by a health system and hospitals. We show specialty pharmacy revenues ranging from $170 million to $425 million—just below the smallest company on the list above. For more, see Chapter 3 of our new report, which provides a comprehensive analysis of the specialty pharmacy market and detailed profiles of the largest specialty pharmacies shown above. Many companies do not report prescription revenues from specialty drugs. We have therefore used various methods and primary sources to estimate the data. As noted in the exhibit’s footnotes, we have made various adjustments to account for the pro forma impact of mergers and acquisitions. The market size figure excludes revenues from provider-administered specialty drugs billed under a patient’s medical benefit. 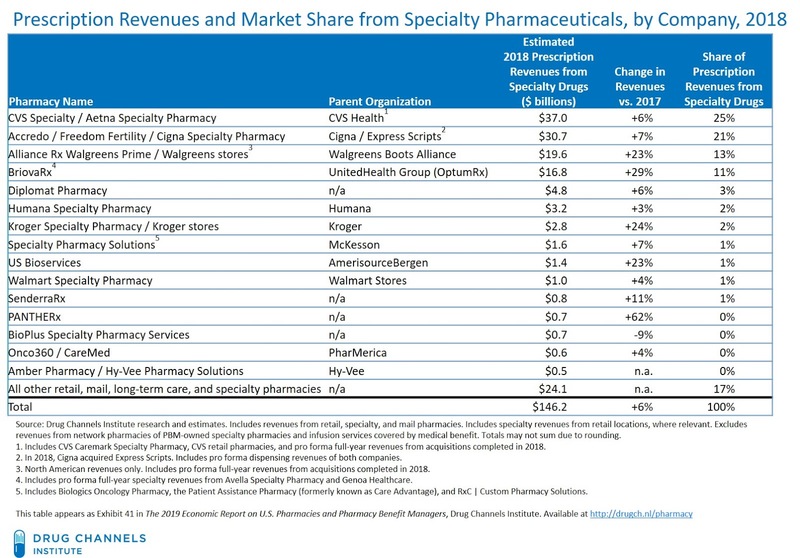 Note that specialty drugs’ share of prescription revenues is lower than plan sponsor pharmacy benefit costs for those drugs. That’s because traditional drugs have larger rebates than specialty drugs, though these rebates do not impact prescription dispensing revenues.